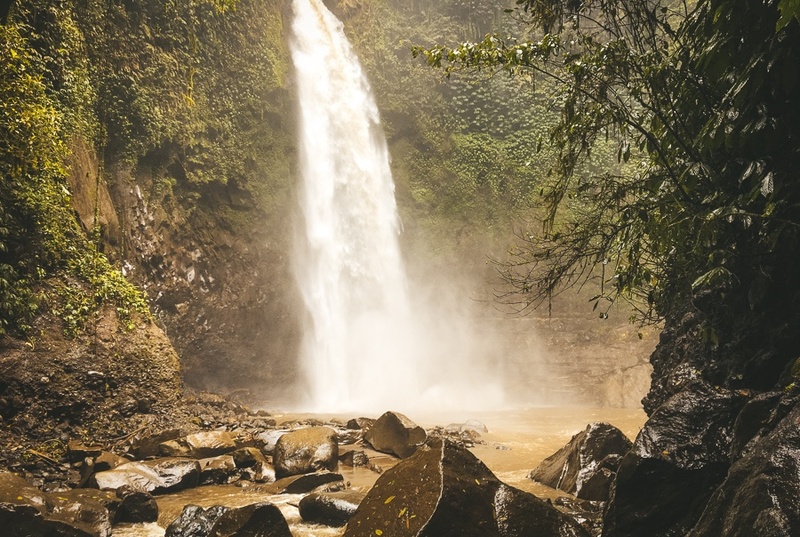 Nungnung is one of the biggest and most powerful waterfalls in Bali. It’s a bit harder to reach than others because you have to hike down a gorge to get to it, but it’s not too bad. There are about 500 steps in total, and it’s worth every step! The jungle surroundings are amazing, and this is also a huge waterfall with a ton of mist flying in all directions. Keep a healthy distance or your electronics might get wet. The rocks near the waterfall can be slippery too, so keep that in mind. The last time I visited this waterfall was in 2017, and it was still a hidden secret. I was completely alone except for a local couple that was also there doing the hike! Nungnung waterfall is located halfway between Ubud and Singaraja. It takes about 1 hour of driving to reach it from either of these areas. The hike to the waterfall is short, but exhausting. Bring water! It takes about 15 minutes to walk down, and 30 minutes to hike back up. As of 2019, the entrance fee is only 10,000 IDR (70 cents).